On March 10, 2011 I did a Q and A with Cary Fukunaga and Mia Wasikowska following the NBR screening of Jane Eyre. Much of the very civilized conversation centered on the value of realism – and how the specific rural English locations sealed the deal in terms of authenticity, especially Haddon Hall in Derbyshire as the Thornfield castle. Link to original NBR review. Jane Eyre, directed by Cary Fukunaga (Sin Nombre), is the first major film adaptation of Charlotte Bronte’s ubiquitous 1847 novel since Franco Zefferelli’s 1996 version starring Charlotte Gainsbourg as Jane and William Hurt as her benefactor/tormentor Rochester. Working with producers Alison Owen (Shaun of the Dead, The Other Boleyn Girl) and Paul Trijbits (Fish Tank) and money from BBC television, Fukunaga has made a film that has the look and feel of a classic yet takes some chances with the material that might risk the “can’t be too faithful to the source material” crowd. Faced with the seemingly impossible task of coming up with a definitive version of a book and story that nearly everyone seems to know (there have been over 25 film and TV adaptations so far) Fukunaga and his team have created a film that captures the spirit and look of the novel in a way that entertains and feels right. Casting a classic is always difficult–if you’ve read the book you have already imagined the perfect manifestations of the central character–probably as people who are in many ways similar to yourself. A film like Jane Eyre, with so many versions already casting impressions on us, can create confusion before we even step into the theater. Ms. Eyre, a teenager in the bulk of the book, is often cast in the Hollywood tradition of the established star–an older successful “name.” Rochester, the mysterious and sometimes coarse man who owns the strange castle she ends up at, seems to be a particularly troubling role to get right. He should be handsome, but not a dandy, brooding but not really disturbed, with a mystery but not unable to appreciate beauty when he stares her in the face. Played by Orson Welles in the Hollywood 1940’s version (to Joan Fontaine’s too old Jane), he seemed a bit “Wellesian,” as though at any moment he might stand up tall and declare “I am Charles Foster Kane!”. William Hurt, in Zefferelli’s version felt a bit eclectic–filled with the same neurotic tics and hesitations we have come to expect from Hurt (History of Violence, for instance). 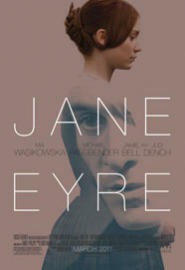 Fukunaga’s Jane Eyre has a marvelous cast that brings the story to life in a pleasing and believable way. Mia Wasikowska (Alice in Wonderland, The Kids are All Right) plays Jane with a gentle but driven side that makes us believe that her spirit has been wounded but not driven from her. Physically she seems no match for the men in her life–the religious man (St. John Rivers played by Jamie Bell) who gives her refuge and especially Rochester, who challenges her at every turn but can not break her composure. Fukunaga’s Rochester is played by Michael Fassbender (Inglorious Basterds) who is handsome and capable enough to bring a combination of elegance and torment to the role that feels appropriate. Paired with Ms. Wasikowska he serves the elusive nature of their relationship (who is really the cat/who is the mouse?) in a way that provides the necessary edge to their dalliance. His hardness can only be softened by someone as innocent and honest as Jane Eyre– but it can’t be easily decoded by her and the script well captures the indirectness of the Victorian mile that feels so different from the social experience of today. The film has a rich but muted look–it plays up the gothic elements of the story, feasting on the strange laughter and screams that echo through the endless hallways and rooms of Thornfield castle, using candle-lit shots to make us wonder who or what might be lurking in the shadows, and taking great advantage of Haddon Hall in Derbyshire–one of the oldest and most appropriate houses in Englan for the story. Many of the shots, especially the interiors, have a surprisingly low contrast look–Fukunaga and his cinematographer Adriano Goldman (Sin Nombre) have avoided the high contrast technique that has been so popular for years–especially in thrillers and action films–for a a softer look. The attention to detail in wardrobe and locations makes the film feel quite authentic. And the landscapes that Jane must traverse when she leaves Rochester and her life at Thornfield are vast, eerie and unforgiving in a way that seem to step out of our memories of the novel itself. Screenwriter Moira Buffini, who last year wrote Stephen Frears’s pastoral screwball comedy Tamara Drewe, has “messed” with the original story in a way that helps to distinguish her adaptation from previous versions. Jane Eyre has four locations which mark the important stages of Jane’s life: At 10 she comes as an orphan to stay with her father’s sister at Gateshead–where she is mistreated. Then she is taken to Lowood, a “charity” school where despite the harsh and miserable life she manages to become a teacher. When she leaves Lowood she travels to Thornfield Hall, where she works as a governess and ultimately meets Edward Rochester. Finally she leaves Thornfield and ends up at the Moor House, the home of clergyman St. John Rivers where she recuperates. Buffini makes a brilliant structural decision that gives the story a modern feel–she opens the plot at the Moor house, where Jane has fled to escape Thornfield, then tells much of the story, beginning at Gateshead, though Jane’s reflections as she ponders what brought her to the religious household. The effect is to engage the audience from a new perspective–building the past until the story catches up with the present and Jane decisively sets off to find some kind of resolution at Thornfield. Accolades should also be addressed to performances by Sally Hawkins, as Jane’s cruel aunt at Gateswood and, especially, to Judi Dench, who plays Mrs. Fairfax, the woman who manages to keep Thornfield hall going, despite the odd events taking place beneath it’s roof. Mrs. Fairfax is a wonderful character because she gives Jane her first sense that there might be good and caring people in the “outside world.” Ms. Dench brings both generosity and mystery to the role, at once taking Jane under her wing while at the same time never revealing (to the audience or Jane) the depth of her knowledge regarding the secrets of Thornfield. If you are new to Jane Eyre and want to catch up on your literary references, Cary Fukunaga’s new film will have a classic feeling–it looks and sounds quite Victorian–and the structure might appeal more than some of the previous versions. If you are a Jane Eyre veteran you’ll probably find some things you like better than the films (or book) you are familiar with, and some things you do not. This is a lean and spiritually faithful adaptation that should find it’s place towards the top of Jane Eyre film canon. This entry was posted in Film Reviews and tagged Cary Fukunaga, Jane Eyre, Mia Wasikowska, Michael Fassbender by Thomas W. Campbell. Bookmark the permalink.